In order to fully grasp what it means to be created in the image of God, we must understand that God created man for relationship. The doctrine of the Trinity is a crucial foundation stone of Christianity. The Father, Son and Holy Spirit are three separate persons in the Godhead. I cannot fully understand this reality with my finite mind. However, I can understand that God is a relational God. The Father, Son and Holy Spirit have always and will always be in perfect fellowship with one another. In Genesis 1:26, the Father tells the Son and the Holy Spirit let us make man in OUR image. Since God is a relational God and man is created in His image, then man was created to relate! There is something inside each and every person that causes us to want to be with other people. Loneliness is one of the leading causes of depression, addiction and suicide. In fact, many of the people who have carried out horrific acts of mass murder, do so because of bullying that isolates them from meaningful relationships. I find it intriguing that even when a person wants to do something wrong, he/she often wants others to join in with him/her. Many of the Proverbs warn us about not joining in with others who want to practice wickedness. Those who want to do wrong always are trying to entice us into joining them. Of course, God’s first reason for creating man to relate is that we might enjoy a personal relationship with Him. When Adam and Eve sinned, they hid themselves when they heard the voice of God walking in the Garden. The Scriptures record that God was searching for them. Sin broke the relationship between God and man that was the fundamenta reason why God created man in the first place. Even though Adam tried to hide from God, God searched for him and restored Adam into a relationship with Him. This is the very reason why God’s Son gave His life on the cross for man’s sin. It was to restore man’s relationship with God. In fact, that is what eternal life is really all about. It is not merely being saved from Hell and saved to Heaven. It is about knowing God. Not only does God want to have a relationship with every one of us, He also wants us to live in fellowship with each other. Man is not designed to live life alone. In fact, after God had declared His creation to be very good, He stated that something was not good. God then formed Eve out of Adam’s side so he could live in relationship with his wife. Marriage, the family, church and community were designed by God for relationships to flourish. When Jesus was asked what was the most important commandment in life, His answer gives priority to the fact that being human means understanding that we were created to relate. To be human is to understand that we were created to reflect and to relate. Here are a couple of questions that I have to ask myself on a regular basis. Is my relationship with God a true measure of how He created me to relate? 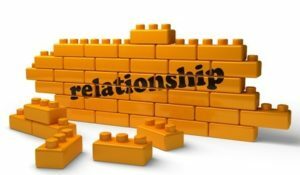 How does my relationship with my wife demonstrate that I have been created to relate? How does my relationship with my children show them what it means to be created in God’s image? Do I love all people as I love myself? How does understanding that I have been created in the image of God for relationships answer many of the issues facing society today? As a school administrator it is important to develop relationships with the staff, students and parents. It is also easy to lose sight of the mission if too much emphasis is placed on relationship building. It is wonderful that God sent His son Jesus to give us a model to follow. Understanding that we are made in God’s image and for relationships is encouraging!